Looking for 22 x 28 wire display systems in single-panel or matrix-style grids? This cable display system comes in all manner of sizes, lengths, thicknesses and styles. Whatever your literature suspension requirement, this website has a support that will be suitable. 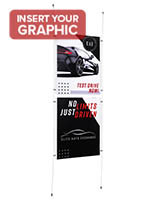 This cable display system is a must-have device for mounting advertising and artwork. From showing an extra-large acrylic sign, or a small stack of brochures, this website provides lots of options for presenting durable, modern fixtures. This cable display system is available in many lengths from 16 feet, all the way up to 82 feet. The attractive satin finish on this hardware looks great whether you are putting an image over a window or making it the focal point of a room upon entry. This cable display system for a flat surface or door will hold many sizes of steel rope from 1.5 mm, ¼", 7/16", 5/16", to 16" thick. Depending on your suspension needs, there are myriad options for hanging. 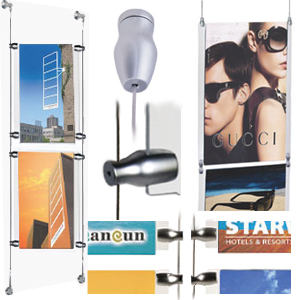 A poster accessory, like this cable display system is also offered in double-sided versions. Get the message to them coming and going! 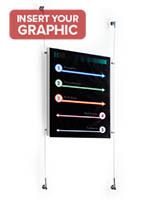 This cable display system allows the suspension of multiple literature boards. Depending on the chosen style, images can be mounted all the way from the floor to the ceiling. This cable display system comes in a dual clamp version that saves your company on hardware. This holder for a sign has so many variations, it's mind boggling! 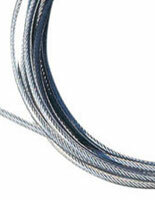 Choose this cable display in one of the many styles shown here. This suspended unit is a big space saver. Open up floor space for furniture or traffic with this cable display system. This presentation fastener to put near a window is inexpensive! 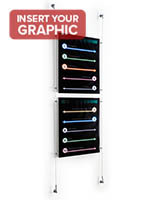 Placing eye-catching brand messaging in an art or professional space with this cable display system is inexpensive! This cutting-edge merchandise for window suspension is top quality hardware! This cable display system is frequently purchased by interior decorators and designers, gallery owners, and buyers. We outfit entire buildings with suspension accessories built to last. Configure a sophisticated space using this cable display system. When shopping for merchandising tools, this is a support system you can count on to keep hanging literature and messaging secure! Do invest in a suspension cable display system like this one that has lots of configurations! Buy a setup like this today! You can't go wrong with this cable display system or with this website Shop with this reliable website for all types of supports. Use a cable display system to make moving through your showroom easier! The effect will amaze your clients. What are some characteristics of this cable display system? This mounting device comes in lengths from 16' all the way up to 82'. 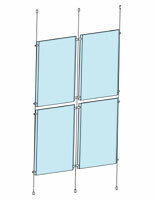 This suspended accessory holds an array of panels in varied thicknesses including 1.5 mm, ¼", 7/16", 5/16", 16". This image support is offered in double-sided, multiple panel, dual cable, and edge grip/clamp versions. Space-saving and versatile for many uses, this hardware cording is lightweight and thin to eliminate bulk without sacrificing strength! This frame rigging provides views of prominent artwork without sacrificing floor space. 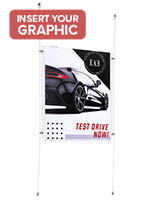 A high performance fixture like this one highlights images that are crucial to a company's brand. This poster sign gives a modern edge to any storefront, gallery space, or business venue. Available for purchase individually or with other accessories as part of a kit, this item supports one message or many, depending on which style is chosen. With lots of configuration options, this type of device for literature like brochures saves floor space. Breaking down the kit as follows, there is the steel roll and hardware made of solid brass that work together to mount a visual. It won't be hard to reach your audience with the combination of suspension tools for sale on this website! Acrylic holders also featured on this website to work with some of the hardware. These also have myriad configurations so ways to promote your company are endless! 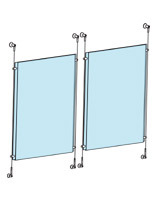 What acrylic sign holders are featured on this website that work with this window rigging accessory? 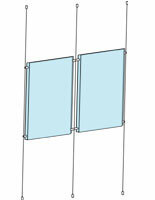 Acrylic literature racks that are 8 ½" x 11" can be configured for one pocket, or several, depending on your preference. There are seven configurations for this size available in vertical and horizontal views, side-by-side-viewing, and more. A poster holder in 11" x 17" are great for magazines, pamphlets (or both!) and come with portrait or landscape viewing capabilities also. This image support is for literature (single and multi-pocket) that is 18" x 24" and there are also several options in this design. This sign support has myriad features for this website to brag about! First, the unit and all variations on the design is inexpensive, which is a boon in this economy. This literature accessory is space-saving to provide plenty of room to configure a showroom or office space. The steel unit itself, no matter what size or thickness, is slim, which gets your gallery or office away from the bulky coils of yesterday. With a silver finish this fixture looks modern. This design is extremely sturdy for confidence when mounting valuable artwork. This hardware supports very heavy objects in the right size. This holder hardware is reliable. Each item featured in this category is a problem solver! This visual tool gives you lots of options when designing a storefront, gallery space or office building. Each variation of this suspended holder is thin, lightweight, and strong. 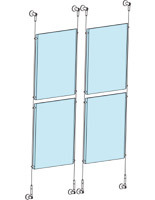 Choose an angled mount to allow flexibility in designing your presentation whether it be near a window or a door! The holder unit that is acrylic has many style options depending on what type of literature you want to mount. A unit like this keeps your literature safe while easily dispensing it to visitors!